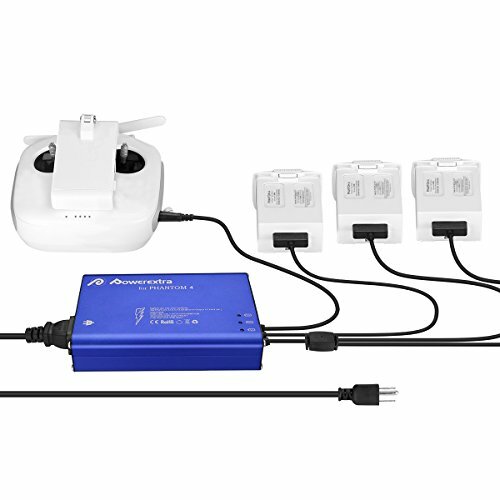 Powerextra Phantom 4/4 pro/4 pro + plus 4 in 1 Intelligent Multi Battery Charger works as a professional battery charger for DJI Phantom 4 Pro flight batteries and remote controller. With multiple charging ports, this charging hub is able to charge 3 flight batteries, the remote controller at the same time. This charger features high output, reliable quality in construction and protection built in. Powerful Input & Output: Input: 100V-240V, DC Output: 17.5V 13.5A (With 3 branches: 4.5A, 4.5A, 4.5A). Perfectly fit for DJI Phantom 4, DJI Phanotm 4 Advanced, DJI Phantom 4 Pro V2.0, DJI Phantom 4 Pro + Plus, DJI Phantom 4 Pro Obsidian Edition Flight Battery. Time-saving Charging Hub: This charger can charge 3 batteries & 1 remote controller simultaneously. It takes only 75 to 90 mins in total to complete a full charge of 3 batteries. Note: When connect the battery, the system need several seconds on automatic identification. Durable Metarial: This charging hub is made of premium aluminum alloy. The sturdy hard shell is fire-proof, heat-resistant and fast in heat dissipation. Intelligent Protection: The built-in safety stystem fully protects the charger from overcharge, over voltage, over temperature and short circuit.